I first heard about argan oil from my sister, who handed me a bottle she got from Australia. She claimed that argan oil treats split ends, dry/damaged hair and dry scalp. I didn't really mind it at first, so I stored the bottle in my closet (of course, now I use it to treat my hair at night - instant hot oil!). And then I heard about it again from my beauty enthusiast friend, L, who introduced to me the many uses of argan oil. That got me and my attention - an all-around beauty product, that's pretty interesting and efficient too! Why have tons of products when there's just one product that can do it all for you? I'm very picky with beauty products because even the "hypoallergenic" ones can possibly irritate my sensitive skin. But when I tried and tested Josie Maran 100% Organic Argan Oil (which I got from Sephora Singapore), after a few days of using it twice a day as my moisturizer, I immediately saw results! It felt like I have discovered the holy grail of beauty products! True, I may not have visible scars, wrinkles, acne. But for the past year I have noticed that my skin had very tiny specks/rashes, which I am pretty sure were not there before. I had tried almost everything from shying away from alcohol-based toners, to visiting the derma but even the dermatologist's AHA toner and cream could only do that much. In the end, I was left with somehow unnoticeable specks on my forehead and eye contour, but it was still there - so it still felt my complexion wasn't really perfectly smooth (perfectionist, I know!). Days of using a few drops of argan oil and I immediately saw results - some of the specks disappeared, and the ones that were left were so tiny and barely recognizable. And then I had this glow - my skin felt moisturized and smooth! Argan oil can be used as a moisturizer, and is safe to use even before applying makeup. It conveniently comes with a dropper so getting and applying the product is hassle-free. It also ensures that there's no waste during application, and not to mention it's pretty hygienic as well! Plus, a few drops goes a long, long way. For my case, I just use 2-3 drops as moisturizer. The possibilities are almost endless on how argan oil can work its miracles, I have read some use it to even reduce the visibility of stretch marks. Okay, it's a great product and all - but did I just say OIL? Just hearing "oil" and you'll say yuck, right? NOOOO! 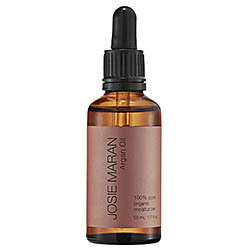 Josie Maran Pure Organic Argan Oil is so light-weight that you barely notice it's there. So definitely, there's no rich, icky texture. It's like a serum that is easily absorbed by your skin. Rich in vitamin E and essential fatty acids, and the best thing - it's chemical free being 100% organic! Give a fresh, youthful look. Safe enough to use on your baby.